Last week, we had a pretty big celebration: my father-in-law’s 80th birthday. It’s actually not until the end of the month, but since the family is geographically scattered, it was the time that two of his kids and their families were able to get together. It just so happened that the get together was in Disney World. After an afternoon at the hotel pool, Pop Pop got to enjoy dinner at Il Mulino in the Swan with his wife (who celebrates her 77th birthday one day later), two sons, two daughters-in-law, and five grandchildren. Pretty fantastic if you ask me. And the meal was divine. I couldn’t eat a lot, but I did enjoy some delicious focaccia, the most beautifully plated prosciutto and melon (shaved slices of prosciutto served with cantaloupe balls, blackberries, raspberries and a drizzle of extra virgin olive oil), and the mushroom risotto. I wish I had pictures to share, but I was too busy trying to eat to bother. We had a lovely Italian red, and for dessert? Platters of ricotta cheesecake, chocolate torte and tiramisu, garnished with berries and served with complimentary shots of limoncello. I couldn’t drink it, but I did have a little taste. I wish I could have taken the entire copper bucket home with me. The service was impeccable, the meal excellent and leisurely. It was the most perfect special occasion restaurant. The night was spectacular. 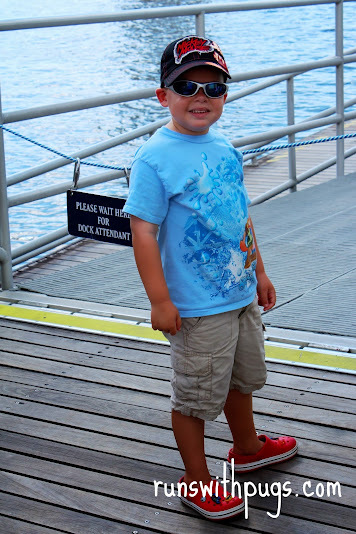 We took advantage of the gorgeous weather by walking around the entire Boardwalk, and got some great family pictures. I fell in love with the moon. Pop Pop and Grandma had to leave in the morning, but wanted to share breakfast with everyone. My sister-in-law was able to secure a quick reservation at Kouzzina by Cat Cora, on Disney’s Boardwalk. This was another place I’d never had the chance to visit and, even though I’m not a huge breakfast fan, I was kind of excited. It did not disappoint. I ordered the Belgian waffle with whipped mascarpone, honey, and chopped pecans with a side of chicken sausage. The sausage was mediocre. The waffle ? So rich and delicious. I never would have thought to top a waffle with that particular combination, but it worked beautifully. I was only able to eat about a quarter of my portion, but I wish I could had more. I also snagged a bite of turkey-sweet potato hash from Mr PugRunner’s plate, and that was also excellent. Little man had Mickey waffles. Of course. We will definitely be back. With our bellies full, we headed to the Ticket & Transportation Center to renew our Annual Passes (We now have the new RFID cards, rather than the old paper tickets. No word on when the wristbands will be ready). Then it was on the monorail for the Magic Kingdom. It was a beautiful day. Hot and humid, of course, but that’s to be expected in July. The crowds, surprisingly, weren’t horrible, either. We had a jam-packed day. Little man rode Buzz Lightyear’s Star Command, the teacups, the Barnstormer and Voyage of the Little Mermaid (it was our first time). He passed on Dumbo and Haunted Mansion. We took a break at around 3:00, returned to the hotel for some downtime, and then went back to the park to ride Splash Mountain and Big Thunder Mountain (it was my first time at night, in the dark, and the view was spectacular), and to see the Main Street Electrical Parade and the fireworks. 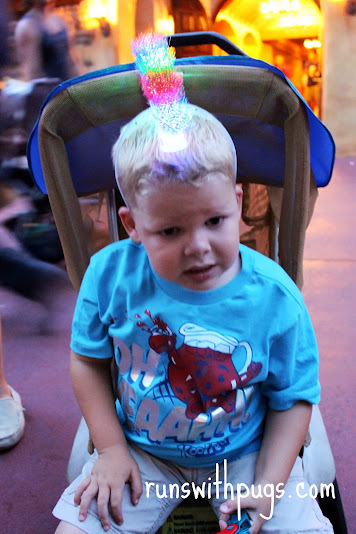 Little man’s aunt treated him and some of her kids to these light-up mohawks. It was a long, late day. We were all asleep about five minutes after hitting the pillows. And good thing, because at 10:30 on Friday morning, we had a bass-fishing charter. While my sister-in-law and I stayed on solid ground, Mr PugRunner and little man, my brother-in-law, and nieces and nephews boarded two boats and headed out for a two-hour trip to the the fishing grounds. I wish I could have been there, but I get sea sick, so Mr PugRunner took these shots. Unfortunately, a really nasty storm started rolling in and the fishing tour had to come to a close at the 45 minute mark. However, that was more than enough time for pretty much everyone to catch at least one fish. He didn’t want to touch it, but he was quite proud. The fishing captains were really wonderful and didn’t even charge for the prematurely ended trip. 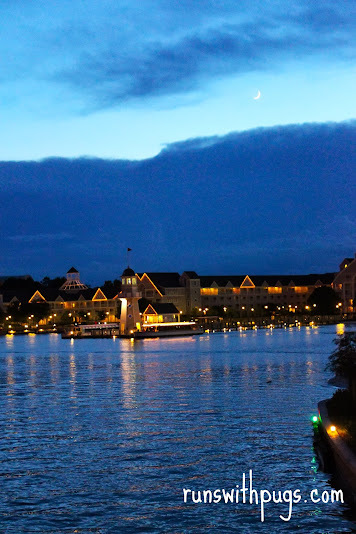 We were supposed to head to Hollywood Studios, but the weather was pretty uncooperative so everyone cleaned up and after lunch at Big River Grille & Brewing Works, we headed to The West Side of Downtown Disney. 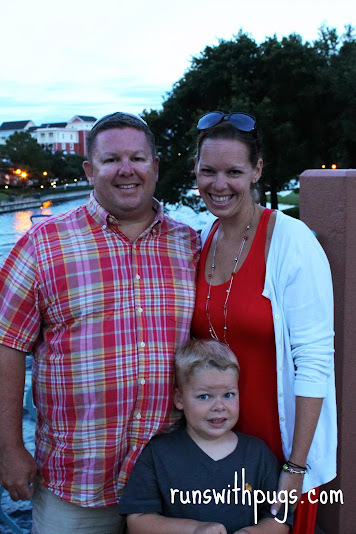 My sister-in-law, oldest nephew and I split off to go see The Heat in the dine-in theater (may I recommend the margaritas) and everyone else went to Disney Quest. Our intention was to head home soon after we were finished, but the weather on the ride home was looking awful and Mr PugRunner wasn’t comfortable driving home in the rain as tired as he was. We decided we would stay one more night and make the journey when we were fresh from a good night’s sleep. and then headed to dinner at the ESPN Club. Nothing fancy. We were so exhausted that one of my nieces fell asleep at the table. My sister-in-law wanted to do Chef Mickey’s on Saturday morning, but they were booked solid. Instead, we scored late reservations for the Cape May Cafe Character Breakfast in the Beach Club. We didn’t tell little man, but when he walked into the restaurant and saw Donald Duck, he was ecstatic. I’m not the biggest fan of buffets, but this one was very nice. I had a delicious spinach, bacon and white cheddar frittata with some fresh fruit, a biscuit and grits. Little man loaded up on Mickey waffles, strawberries and even got a bowl of Froot Loops (a special treat, since I won’t buy sugary cereals for the house). Most importantly, we had some great character interactions. We even got to see Minnie and Donald twice (Goofy came around one time, but he hung out for quite a while). When you go on vacation, do you prefer to kick back and relax or be on the go all the time? What was your busiest vacation? Your most relaxing? Don’t forget to check out my ENERGYbits giveaway! See what I had to say about these one-ingredient algae tabs and enter to win a sample for yourself! What a fun vacation! Your pictures are amazing my camera do you use?? 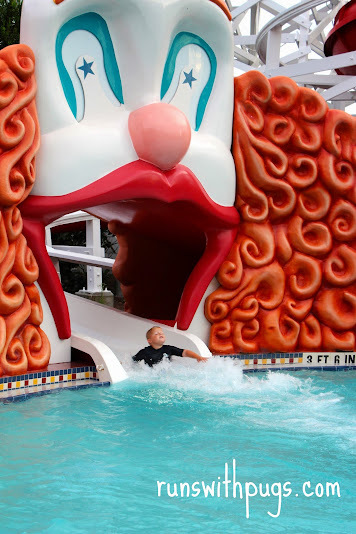 That clown slide- I don’t know whether to be scared or to have fun with it! The clown slide was pretty terrifying! I shoot with a a Canon t4i. I only bring my 18-55 lens to Disney just because it’s light and I usually don’t have a lot of space or time to take pics. When it’s less crowded, I take one of my nicer ones and take a little more time. On the go all the time. What a fun vacation you had. All. The. Time. Next week? I’m doing nothing. It depends what kind of vacation it is. If it is one with Jeff’s kids then it has to be on the go. If it is just me and Jeff, then we mostly relax. I can’t handle relaxation. Even though it’s exhausting, I really love being on the go. Wow, what a magical trip! Lucky kid you have there. Wow, that boardwalk is gorgeous! It is so nice there. What an amazing trip/bday celebration!!! Looks amazing! Whenever I go to visit family in Southern California and go to Disneyland, I feel like we try to cram a lot in! I love to visit my mom in Arizona over the holidays and relax with movies, hot cocoa, and a lot of family time. Hands down the MOST relaxing vacay I have ever had was an amazing weekend with my friend at the Solage resort in Calistoga. It was nothing but lounging, bike riding, sauna-ing, tea drinking, and spa treatments! I am the worst at relaxing. No matter where we go, I want to get up and see all the things. Drives Mr PugRunner insane. LOL! I want to get out to Disneyland one of these days. It would be so nice to see. Haha your son is so cute in all of your pictures! That is so neat your family was able to get together for your Grandfather’s 80th! My family was able to do the same for my grandparent’s 80th last year which NEVER happens and it was so cool! So fun that you have annual passes and get to go to the Boardwalk for meals. The tourist in my is beyond jealous! It’s really worked out for us. This is our second year of APs and we really got a lot out of them last year. Since I am signed up for the Tower of Terror 10 Miler, and meet friends and family in Disney throughout the year, it only made sense to renew. We got to try a lot of new restaurants this time, and I loved it! 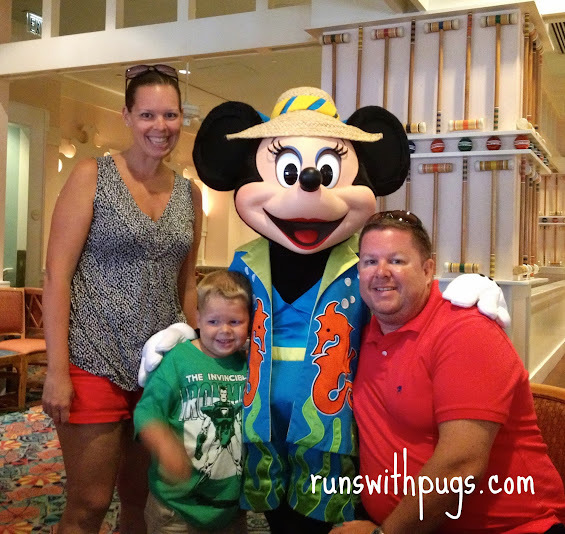 Mindy @ Road Runner Girl recently posted…Magical Disney Favorites! Looks like you guys were at the Boardwalk?? 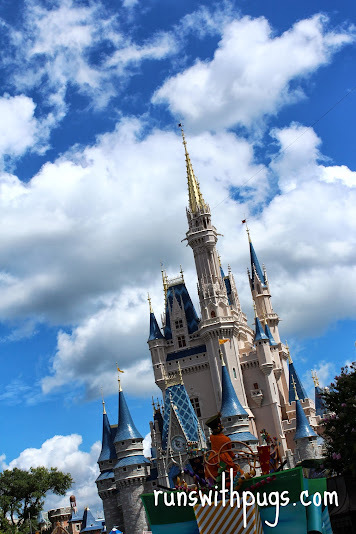 I’m hoping to score a room there for Princess weekend – we’ve never stayed there but you guys ate at some of the places I’m hoping for!! Yes. We stayed there for a couple of nights. It was really nice. We definitely got to try a few new eateries this time, which was awesome. I’ll be posting about Be Our Guest in the next few days. That’s how they get you… I hope you can go again soon!